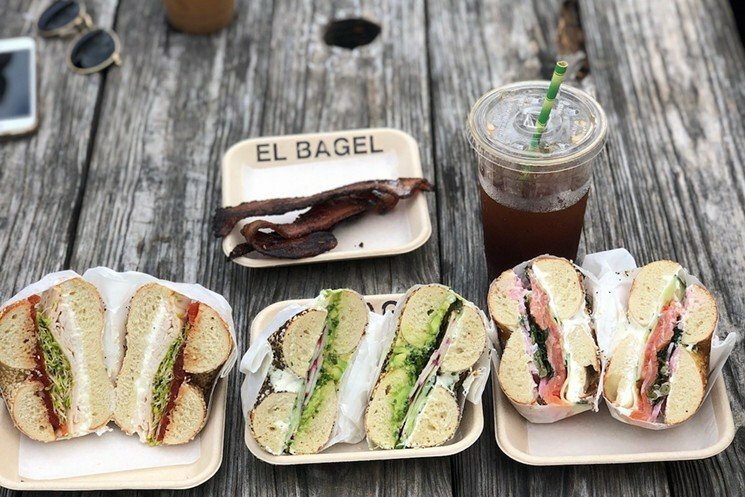 After two years of slinging breakfast sandwiches off rickety trucks, Matteson Koche’sEl Bagel has secured a permanent location at 6910 Biscayne Boulevard, with plans to open later this year. The new space will join Phuc Yea, Blue Collar, and Jose Mendin’s recently opened La Placita in the MiMo District. Koche’s six-ingredient bagels, free of the conditioners and preservatives found in many modern renditions, burst onto the scene two years ago while he was still working a day job as an engineer. And like his unfussy bagels, expect simplicity from his permanent spot. It will consist of little more than an L-shaped counter with a few tables inside joined by a few more on an outdoor patio. The menu will hold true to the 27-year-old’s focus on bagel sandwiches, which have garnered a cult-like following with classics like bacon, egg, and cheese ($10) and lox supreme ($12), alongside funkier creations like the King Guava ($9) with its namesake marmalade, potato sticks, cream cheese, and fried egg; and the Que Fancy, a collaboration with Itamae which features an everything bagel with wasabi cream cheese, salmon rose, cucumber, microgreens, shaved red onion, and dill. Bagels can be ordered open-faced, which in truth is far superior to the unwieldy sandwich. At the moment, Koche and a motley crew bake around 500 bagels a weekend, mostly for sandwiches, when his truck — which will remain active — is stationed outside of Boxelder Craft Beer Market on Saturday morning and Vice City Bean on Sundays. If you follow El Bagel on Instagram, you know it’s only a couple of hours before the ominous “SOLD OUT” sign emerges. People have driven from Broward County for Koche’s creations. Two weekends ago, people waited out in the rain for them. Some linemates have even become friends. It’s bagel magic, baby.